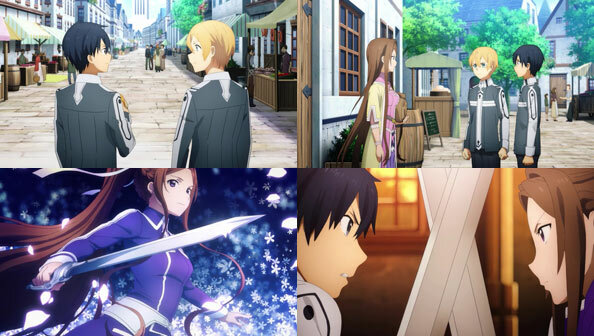 As Asuna has arrived at Rath and taken a seat at the table when one wasn’t offered, Kirito continues to play, or rather live, in the Underworld. Two whole years have passed since we last saw him, and his goals remain the same: to learn this new virtual game’s rules, abide by them as he and Eugeo seek Alice, and most importantly, get good enough to face any opponent that might crop up. To that end, after winning a swordsmanship tournament, they enrolled at Swordcraft Academy in the capital Centoria, to serve as pages to their mentors. Kirito’s mentor is the Second Seat Sortilienta Serlut, or “Tiena-senpai” for short (SSSS could also work ;), ably voiced by Han Megumi. In the time he’s trained under Tiena, Kirito has learned that attaining strength in this world is, unlike SAO or ALO, as much about confidence and willpower as the hard numbers. 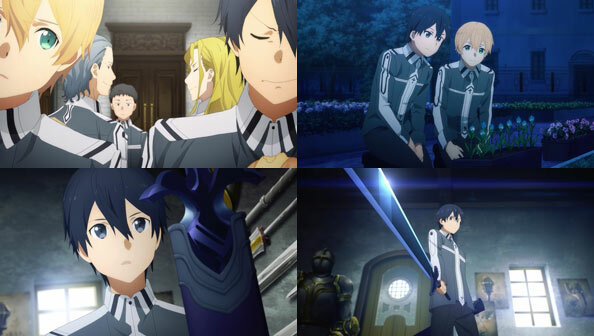 Since they’re now in the Big City, Kirito and Eugeo’s statuses as commoners makes them the target of pompous high class elites who are always trying to press their buttons. 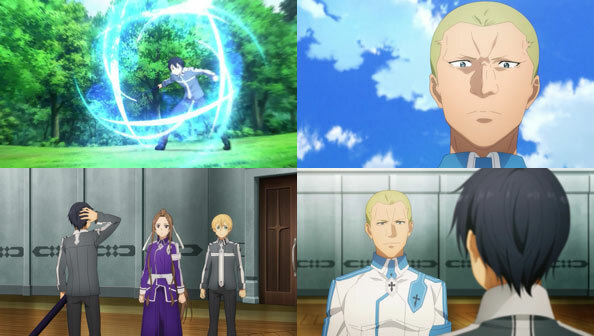 When Kirito showed Eugeo the progress on his garden, I thought for sure that garden was going to be destroyed by the two punks who tried to provoke Kirito in the dining hall. But before the session, Kirito picks up a newly completed sword from the metalsmith’s which was forged from a branch of the Gigas Cedar. The resulting black/blue blade is definitely Kirito’s style, and when he successfully swings it, he even gets it free of charge. Kirito can’t help try out sword skills he was unable to break out with a simple wooden training sword, but in his enthusiasm to do so, he gets mud on one Volo Levantain’s crisp white uniform. Volo lets him off for practicing on a day of rest (he himself finds it hard to keep back from doing that, and understands as a fellow swordsman)…but he won’t let the mud stain slide. So he challenges Kirito to a public duel to first point (not stop short) with real swords, perhaps eager to see what he can do with his new black blade. Kirito has never defeated Liena in a training session, and she’s never defeated Volo, so his mentor is understandably nervous about what he’s getting into. As for Eugeo, he’s just surprised his friend didn’t get into trouble much earlier. Of course, Kirito has only fought with wooden swords at Swordcraft Academy; more training tools than actual weapons. We’ll see if he gets embarrassed before his mentor, friend, and assembled fellow students (not to mention punished for breaking the sabbath), or if he’ll be able to call his new blade Volo Levanbane…should he choose to.